The 6 Best Hot Dog Joints in Nebraska! Nebraska may be the land of steaks, but that doesn’t mean you can’t find an incredible hot dog in the state! Craving a Coney Island or Chicago-style dog? You can get that right here in Nebraska. Or maybe it’s a gourmet frank you seek? We’ve got that too! Here are the six best hot dog joints in the state. The Coney Island Lunch Room has been a Grand Island staple since 1933. Take a step back in time and order a Coney hot dog, fresh cut fries, or the classic chili. If you have room for dessert, don’t miss the chocolate milkshakes! If you’re looking for a typical Chicago-style hot dog, with all the Chicago-themed decor to go with it, this is the place. Chicago Dawg House is famous for its menu filled with Chicago favorites such as dogs, polishes, and hot beef sammies. B&B Classic Dogs has something for everyone. 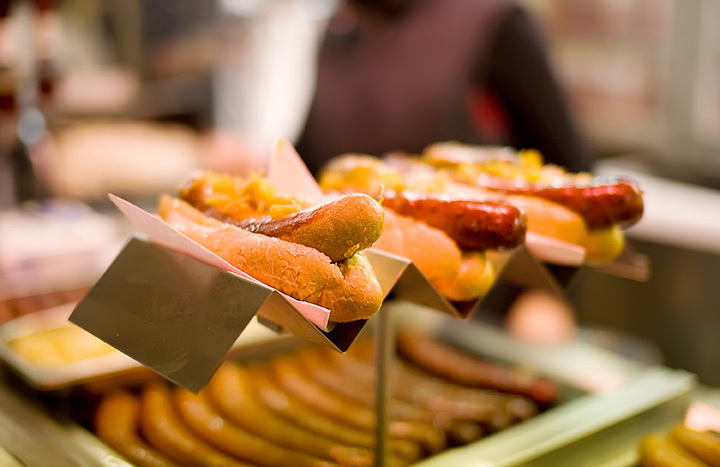 From classic hot dogs to fried dogs on a stick, this restaurant and arcade is synonymous with laid back fun for kids and adults alike. B&B Classic Dogs serves up a myriad of unique flavors and toppings—such as purple pepper jelly and a mac and cheese dog. Julie’s Hot Dogs is like something you might find in a big city but located right here in Beatrice, Nebraska. The push cart features a delicious classic Chicago Dog, a quarter-pound beef Skoob Dog, and a Reuben Dog dressed with corned beef, Swiss cheese, and served on a toasted rye bun. What’s not to love! When you think of Nebraska, you probably think of beef. However, in the beef state the hot dog stand, Fauxmaha Hot Dogs, is drawing serious crowds with its dogs made from a combination of tofu and seitan. The vegan dogs are served up in three forms: The BBQ dog, the Banh mi, and the original dog. You can find them setting up shop at various local businesses around Omaha. In the mood for a gourmet hot dog? Sprocket’s Famous Freedom Dogs in Kearney, Nebraska, attracts visitors from nearby towns to its gourmet hot dog food truck which serves a one-quarter pound, all-beef Nathan Coney. Each hot dog can be topped off with delicious extras such as chili, onions, and their very own special Coney sauce!